The chain looks like this: I read an article by A.S. Byatt about children's literature at the turn of the (nineteenth to twentieth) century, she being somewhat of an expert since the research that went into The Children's Book, and felt a compunction to re-read some of those classics she mentioned, books that had had a profound effect on me as a child (though I am not quite Edwardian), such as The Secret Garden and The Phoenix and The Carpet. Thus, I found myself in the Children's Classics section of Britain's only High Street bookshop. And there I stumbled upon the beautiful item pictured above. This edition of The Chalet School in Exile, says the blurb on the back, "has been published to commemorate the 70th Anniversary of the outbreak of World War II, and in memory of all those who lost their lives." Now I am a huge fan of the Elinor M Brent-Dyer / Angela Brazil school (excuse the pun) of writing - I spent my childhood summers in my grandparents house in Devon, and the bedroom in which I stayed had a cabinet crammed with such books, most of them with my great-aunt's name scrawled lazily in her own hand on the inside cover. A voracious reader even then, I ploughed merrily through the lot, ankle-socked legs waving in the air as I lay on my stomach in nana's garden, gently turning the kind of nut-brown only children go and that I have never gone since. (It may be worth noting that this was in fact during the 1970s/80s, and not the 1920s, as I like to make it sound. It may also be of interest that my favourite treasure in this cabinet of stylised girlschool literature was the beautifully dated Dimsie Moves Up, whilst my favourite of the cover art was the dust jacket of The New House Mistress). 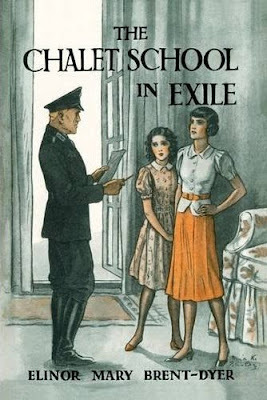 The Chalet School in Exile has been re-published (it was originally available in 1940) by an outfit I had not heard of until now, Girls Gone By Publishers, whose website I shall be visiting regularly as of today. It's a beautiful paperback edition (£12 at Waterstones), published using the full first edition text and with matching cover art: "This original dustwrapper is extremely rare, and, very unusually, it was changed while the book was still in its first printing. It is thought that Chambers received complaints that the illustration was unsuitable for children..." Indeed, it shows a Nazi commander questioning two girls, pupils at the eponymous Chalet School in Austria, when the country is invaded and the school inhabitants are forced to flee. Well, I don't blame you for being excited - it looks wonderful. Publishing history can be very interesting too - I always read any details that are there. I somehow missed out on reading the Chalet School series while growing up but I'd love to try one now. I love that cover! The cover IS fabulous, isn't it? I adore the artwork used on these early girlschool books; I have a few framed and up on my walls. They evoke the era better than any other genre's art, I think - the innocence of the girls themselves, often caught in some extreme or inexplicable situation from which they must disentangle themselves, honour intact. The muted colours and simple lines reflect the regimentation and claustrophobia of the boarding school, but often, minute details - someone's expression, for example, or stance - indicate a deeper threat, a darker thread. i just love them! Beautiful cover. It really represents a bygone era. I love how children's books are now sort of springing into popularity. I think it says a lot of the society that perhaps many adult books miss out on.